It’s not something you hear much about in New Zealand, but Australia is currently in the middle of a major apartment boom. The number of dwelling approvals – what we would call building consents here – for attached dwellings is at an all-time high. 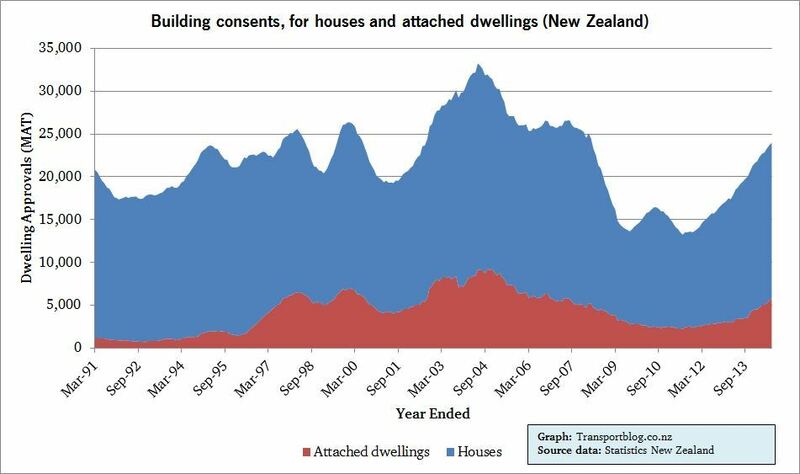 * 86,000 attached dwellings were approved in the last year – compared with 5,800 in New Zealand. One of the things I find interesting about this graph is that Australian construction, for all its ups and downs, has actually been fairly stable over time. There’s the odd slowdown, but generally this is a country that has churned out around 160,000 new homes a year for the last 30 years. 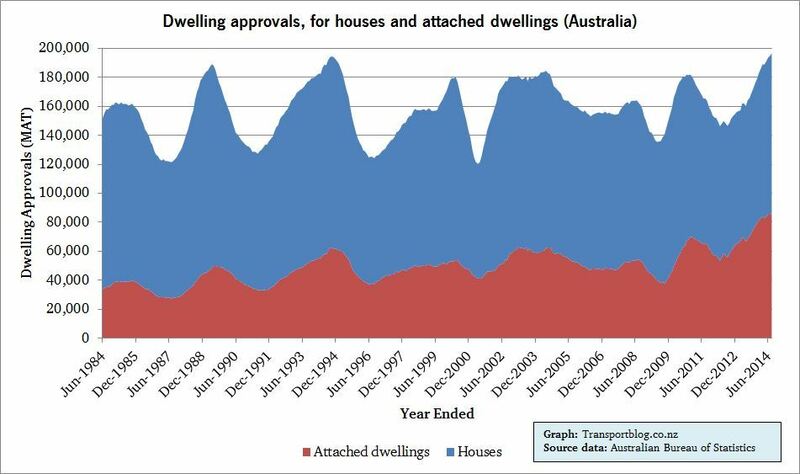 In Australia, attached dwellings usually made up 20-something percent of all approvals through the 1980s, and 30% to 35% through the 2000s. It’s only in the last few years that the percentage has climbed above 40%. For New Zealand, the data doesn’t go back as far – and I’m a bit sceptical about its coverage in the early ’90s as well – but in the last twenty years we’ve usually fluctuated between 20% and 30%, dropping a bit lower than that in the post-GFC period. In the next post, I’ll look at the data for individual cities. 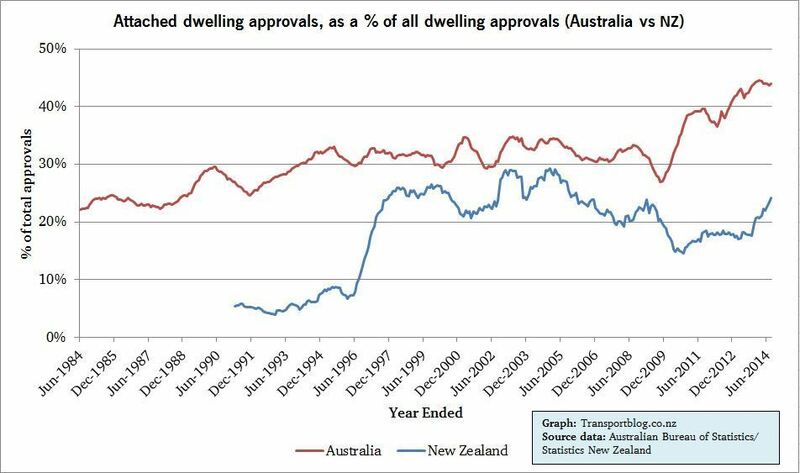 * Technically, the Australian approvals are for “dwellings excluding houses”. That covers apartments, terraces and so on. This is generally similar to the definition used by Statistics New Zealand here, where they use the term “apartments” to refer to “consents that have 10 or more new attached dwellings”. I’ve used customised data from Statistics NZ so as to include all the attached dwellings in the 0-9 dwellings range as well. This analysis was initially put together for a company newsletter here. This is a record of the accelerating urbanisation in both countries, a change consistent with the rest of the world. It will continue in Aus and Auckland. Would be interesting to see where in Australia the new apartments are being built. Given house prices in Sydney and Melbourne in theory those two cities should be dominating the apartment building landscape. I suspect there is more apartments to be built than house in Melbourne. Auckland really need a good value for money body-corp, durable building quality, buyer legal protection, eased bank lending rules, and car independent public infrastructure in order for apartments to be as desirable as house. In regards to Sydney, apartments are being built everywhere and on all types of land, green fields to ex-office space. North Sydney; within 500m walk from my work is 4 large developments all ex-office space and couple of smaller ones – 1 bedders going for almost 500k. Out southwest up to norwest new suburbs with both freestanding houses and apartments up to 4 stories are being built. There is a lot of intensification going on around the new norwest metro train line and the new line out to Leppington. The new “Fonzie Flat” (happy days – apartment above the garage) is making an appearance in the northwest too. This year has seen the building industry ramp back up. Sydney really has no choice but to intensify even more as projections range from 6-8 million people in the next few decades. The real challenge though is quality of build and diversity of stock. And also I belief getting some sort of ownership structure that is less precarious than landlord:tenant but not as big a financial barrier as mortgage lending. The trend towards city life has really taken hold in Australia. Even in Canberra the apartment boom has taken hold and has been more than 50% of dwelling constructions for a few years now, the result has been fantastic for the city there are now some really excellent spots – though there have been abominably designed disasters. There are some interesting suburbs in Canberra that were once all detached dwellings with large gardens that are now very attractive, leafy suburbs with 3-5 story apartments. I’m not sure this could be replicated in other cities, as it was largely made possible by the previous run down nature of the suburbs (too run down for NIMBYs) but its interesting none the less. Apartments going up everywhere here in Melbourne, mostly close to PT and close to the city. I live in one. Close to everything and easy to get around without a car. “Without a car”. Read it and weep Auckland.